MEDICC REVIEW goes in-depth on Autism Spectrum Disorder in Cuba, how it is diagnosed, treated and managed. Autism Spectrum Disorder (ASD) in Cuba, detailing accounts of persons, family members and health care providers managing this condition, is the lead feature in the April-July 2017 issue of MEDICC Review. The 1992 Constitution contains guarantees for persons with disabilities, but health care providers note that in the case of ASD, broad efforts are still hampered by a lack of a definitive study on its prevalence in Cuba. Nevertheless, an intersectoral nationwide program is under way to foster acceptance and inclusion for ASD individuals and their families. 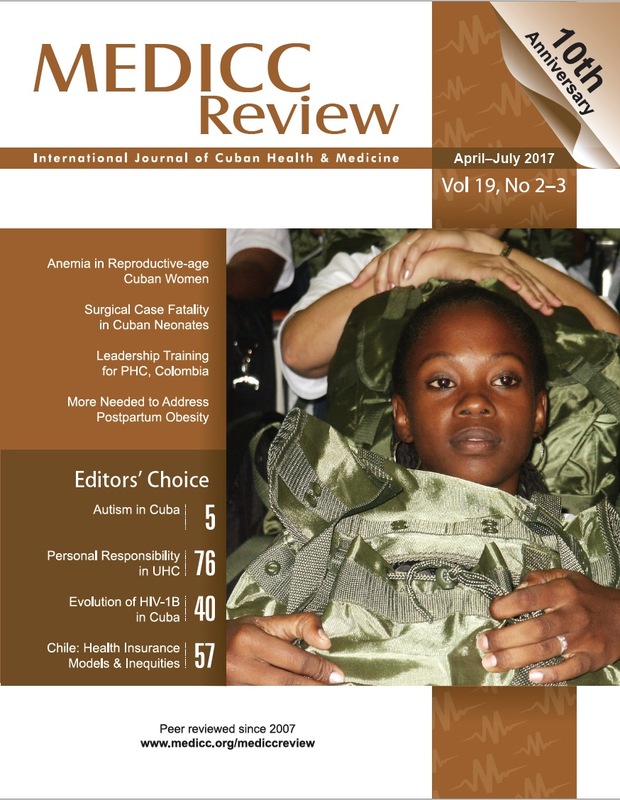 This issue of MEDICC Review online also uses its cover to congratulate Cuba’s volunteer Henry Reeve Medical Contingent, winner of the WHO 2017 Global Health Prize. Formed in 2005, originally destined for post-Hurricane Katrina service in New Orleans, Cuba’s offer was rejected by Washington. But several thousand specially trained disaster responders went on to serve in dozens of countries, including Haiti and Pakistan. Our Editor’s Choice section in this issue includes a Viewpoint on the role of Personal Responsibility in Cuba’s Universal Health Model,, original research on Origin and Evolutionary History of HIV-1 Subtype B in Cuba and Chile: Health Insurance Models & Inequalities. See the current issue for the full Table of Contents. IMPORTANT NOTICE: MEDICC Review is accepting manuscripts until September 1, 2017, for its special April 2018 issue on The Road to US-Cuba Health Cooperation, under the guidance of two distinguished guest editors: Dr. Pastor Castell‐Florit (Director of Cuba’s National School of Public Health, accorded the PAHO Health Administration in the Americas Award 2016) and Dr. Jon Andrus (Senior Investigator at the University of Colorado’s Center for Global Health, and former PAHO Deputy Director). The aim of the special issue is to reflect work designed collaboratively to contribute to population health, health equity, social determinants of health and wellbeing, global health cooperation, disaster response, environmental health, medical research to tackle diseases, health systems research, and all bilateral programs that frame “health in all policies”. Consult Author Guidelines. MEDICC Review is the first peer-reviewed journal in English dedicated to publishing original manuscripts by Cuban health and related professionals on topics of medical research, population health, and policies and practice of health in Cuba. The journal also publishes international authors on subjects related to health equity and vulnerable populations. Over 40,000 articles are accessed monthly by readers in 140+ countries. Founded in 1997, MEDICC is a US non-profit organization working to promote US-Cuba health collaboration and highlight Cuban public health contributions to global health equity and universal health. MEDICC facilitates mutual learning opportunities in several ways: its documentary film ¡Salud! ; the open-access, MEDLINE-indexed English journal, MEDICC Review; insightful trips to Cuba for US health policymakers, educators and practitioners; a national network of US communities whose leaders have been inspired to innovate for better health, thanks to their MEDICC-organized experiences in Cuba; and by serving as an institutional bridge-builder between US, Cuban and global health institutions and organizations. MEDICC also assists US graduates of Havana’s Latin American Medical School to return home to practice in provider-shortage areas, and supports US policies that facilitate greater health cooperation with Cuba for the benefit of people in both countries. To achieve our vision of health for all, MEDICC works with a global alliance of people who care about how others in the world live, learn, work, eat, play, and receive health care.